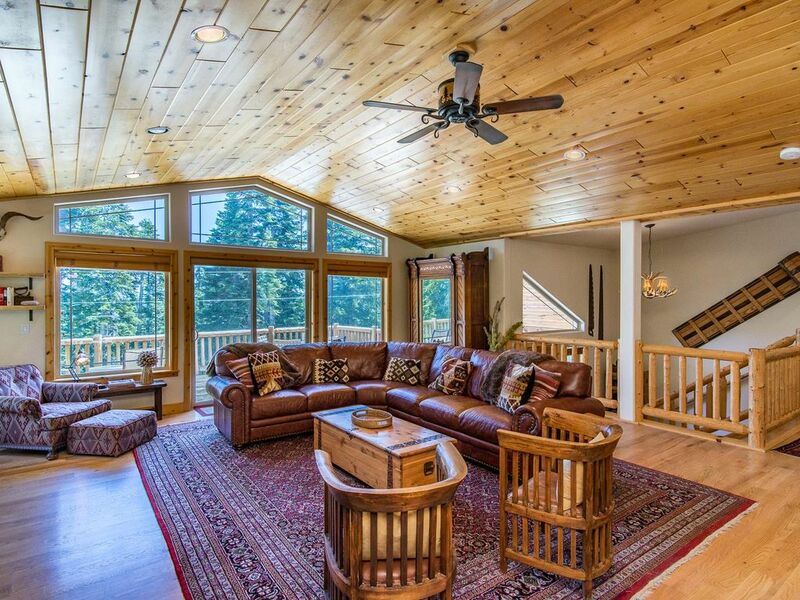 This elegant, newly-built mountain retreat is located on the colorful and traditional West Shore, in the serene Talmont area, with membership to the private Tahoe Park Beach Club. The idyllic setting offers tranquility and privacy, but as our home is only 2.5 miles west of Tahoe City, you will also appreciate the shopping and dining convenience it affords. Surrounded by multiple forested conservancy lots on three sides, this welcoming 2500+ square foot home offers privacy, a filtered peek of the lake and an expansive tree top view. It is very tastefully decorated, newly appointed throughout, and fully and thoughtfully equipped, assuring your vacation relaxation. Our home is lovingly furnished with comfort and quality in mind. We regard it as our beloved second home, as opposed to a rental income property! We gladly open our home to others and appreciate the fact that our guests will show it the same respect that we do. We have furnished our mountain retreat with cherished antiques, family heirlooms, and warm hand-made and custom-made furniture, along with new beds and linens. We offer 4 bedrooms and 2.5 baths, and a fold out Queen-size sofa. Our home boasts knotty pine cathedral ceilings, knotty pine custom cabinets and trim throughout, granite kitchen and bath counters, along with wood and slate flooring. The entry is showcased by a wide staircase accented with hand-carved pine railings, leading up or down to either of the two living areas. Upstairs, the main living/dining/kitchen area is airy and expansive, featuring two decks, overlooking the forest. The large, leather sectional is flanked by club chairs, providing a comfortable sitting area. You’ll enjoy a flat-screen, HD TV, which is highly maneuverable to allow for utmost viewing options– it has a Blue Ray DVD and an extensive cable package with music stations, along with an option to plug in your own iPod, or your computer for viewing your vacation photos. Unlimited free high-speed Internet access is provided. In addition, we have installed an Apple TV device, which will allow you to rent movies and more via your own account with Netflix and/or iTunes. The upper floor hosts the spacious and luxurious master bedroom featuring a Californian King bed and master bathroom, with Jacuzzi soaking tub and enclosed glass shower. A half bath is located off the living area and a charming ceiling fan provides a gentle, refreshing breeze on summer evenings. Downstairs, the family room is a perfect gathering area for youngsters– young and old–a leather sectional faces a large TV, with DVD, and VCR. Leading off the family room are three bedrooms and one full bath: one bedroom features a queen bed, another has a full-size bunk bed, with full-size trundle (this room can sleep up to six children) and an antique desk, the other bedroom has two twin beds. In addition, the sectional in the downstairs living area holds a queen-size foldout bed. You’ll love our private beach club 1 mile down the road! Charming Tahoe Park is one of the most popular beaches on the lake, offering over three acres of beach front living. It boasts a lovely beach, little nooks sheltering private sitting and dining areas, grass areas surrounded by gardens and shaded by towering pines, BBQs with tables and benches, piers, kayak access, shuffleboard, volleyball, horseshoes, basketball, a children’s playground and restrooms. Relax in privacy and enjoy a lake front BBQ! Google their website for photos and more info- 'Lake Tahoe Park Association'. Next door to Tahoe Park Beach, sip cocktails on the lakeside deck of festive Sunnyside Resort, while watching the sun set over the lake and boaters pull in after a day on the lake. You’ll savor the breakfasts at the nearby Firesign Café. Paige Meadows, with its a huge network of superb hiking and mountain biking trails, is only steps away from our mountain home. Lake Tahoe is renowned for it’s natural beauty and numerous outdoors activities including river rafting, extensive hiking and biking (on both paved and dirt paths), fishing, swimming, boating, and all manner of water sports. Best of all is just relaxing on the beach or a reading a good book while lounging on our decks, enjoying the pine-scented mountain air! Our kitchen is very well-equipped; the dining table expands to seat ten, with additional seating for four at the kitchen island. You’ll enjoy a gas Webber BBQ, clothes washer and dryer, and garage parking for one car. Additional outdoor parking is also available. We welcome you to our tree-top mountain home! Please check in for updated photos, as we are improving our home at every opportunity! We have owned a cabin in Tahoe for over 20 years- an older cabin and now this new one. Owning a cabin has provided us a with a delightful venue, allowing us to spend quality time with our family and each other. We have looked on the West Shore for years in search of a more private cabin than our first one. This particular aspect is an overwhelming priority for us, perhaps simply because our primary residence is also very private, and it is what we are accustomed to. Of course, along with privacy, everything thing else about it had to be just what we wanted- if not, we were plenty happy with our older cabin. When we discovered this property, we knew it was prefect for us! Located in an upscale neighborhood, our mountain home is private, quiet, and surrounded by forested conservancy lots, and offers a filtered, treetop lake view. Of quality construction only several years old, it is thoughtfully and tastefully furnished, appointed and maintained. Families will appreciate the downstairs family room when entertainment tastes differ among varying age groups. You'll experience great walking, hiking and biking year round at nearby Paige Meadows. Our private beach is delightful for all age groups- stake out your little nook on the shady lawn, reserve a table for a barbeque, or opt for tanning on the beach. Tahoe Beach Park activities include horseshoes, volleyball, basketball and a playground for the tots. The private beach will prove to be an even more valuable asset, should our nearby state parks close for public use. Our location allows for your choice of vacation options- nonstop outdoor activities and convenient dining, or cozy cocooning. Our home sits on an extremely quiet street, approximately 800 feet above the lake. Our front deck provides you with a 'Peek of the Lake,' and an expansive treetop view. large open plan living/dining/kitchen, living room opens to front deck ; kitchen/dining area open to back deck and BBQ. There are some up there but pieces tend to get lost. If you have favorites, we suggest you bring them. Those wishing to bring their boats may purchase available short term buoy space at our private beach, Tahoe Park Beach. Adjoining the kitchen, the private back deck is perfect for BBQing– 2 rocking chairs provide a leafy retreat. The large front balcony extends the open plan living space & offers a peek of the lake. For their 11th birthday all my nieces wanted was to stay in a cabin in the snow. They spent days choosing the right one. Following a long stressful drive, I arrived a few hours after my sister. She told me that there was no hot water and that she had tried to call the home owner on the numbers left by the home owner, she received no answer. As she is leaving the home owner a message, the home owner tried to call. As soon as my sister hung up, she called the owner back right away. Her calls got forwarded 4 times! The owner never tired to call us back that day. Next day, I text her and let her know the emergency, we are now on day 3 of no hot water. She stated that she would prefer that I message her via the Homeaway site, which I did. When she messaged me back HOURS later, she simply said "nobody will be there until tomorrow. Maybe you can have one of the men there with you guys climb up and knock the snow off the flue. She stated that it "always happens" during a large snow fall. I sent her pictures of the actual water heater that had frozen water coming out all over it. Her reply was that it was a known problem and that there had been people up there weeks ago to try to repair it. There was never a sense of urgency on her part to have the problem resolved even after I told her we had sick children that needed to be bathed. Home owner seemed organized, binder with all the pertinent information, notes in a couple of places with her and her husbands numbers on it, even a plumbers name and number in the binder. When we called him, he stated "nope, I'm not coming out there in this snow." Why have all this information for the renters if it is useless. Not even the homeowners numbers were useful. Aside from the one call attempted by her on the first day (even though I felt she was calling us lairs by saying neither her or her husband had missed calls or messages from us, even AFTER I sent a screen shot of a missed call to my sisters phone) she didn't even try to get ahold of us to check on us or even to apologize. She stated her reason for her supposed lack of receiving our calls or messages was because the phone services was probably bad, even though we all had perfect reception. We’re sorry that you had a 30 hour drive & that you had no hot water due to the historic February snowstorm. When we heard that a huge storm was coming, we offered you early check-in anytime on Friday, to beat horrible traffic and road closures. We can’t control Mother Nature, and as stated in our contract, weather-related refunds are not allowed. Nevertheless, when we asked what you felt was fair compensation for not having hot water, you replied “half off"–so that is what we gave you. We have had only 4 or 5 star ratings, and have had NO complaints until yours. We strive to make all our guests experience a great one– this is evidenced by our high ratings. You misunderstood some of my statements, & much of what you claim is not true. We did not receive most of your claimed phone calls–we were home all weekend & had no phone messages on our landline or cells. That’s why I suggested we communicate through the VRBO website, a successful means of communication. Phone service in the mountains can be problematic, especially during storms. When we learned there was no hot water, we tried to get a plumber, but due to the storm, no one could come until Monday morning. We suspected the hot water problem was due to the hot water heater vent being covered in snow, and the pilot light would not stay lit. I told you this happened ONCE years ago during a heavy snowstorm. The plumber you contacted “would not come out in this snow”. We also tried to get a crew to shovel the vent area, but likewise they could not come until Monday morning. Your suggestion that I was doing nothing to help is simply false. There is no “known problem” with the water heater. We did NOT, as you said, have the water heater repaired 3 weeks ago. We hired a crew to shovel all snow (and vent area) in anticipation of your arrival, at a cost of over $3000. I cannot FORCE workers to come at risk to their own safety. I did say that if you really wanted hot water, you could dig out the vent area yourselves, requiring some effort on your part. There is no "climbing" involved– the vent is located on ground level adjacent to the water heater in the garage. This I explained to you.The contractors came out Monday morning & quickly fixed the problem, which indeed was that the vent was covered in snow. Everything was fine for the guests who arrived later that day. Despite no hot water, we hope your children had fun in the fresh, abundant, & fluffy snow! We so enjoyed our stay- this cabin is a great getaway! It's peaceful and quiet but also close to grocery stores, restaurants, and coffee shops. The cabin was clean and had all the amenities we needed. Great location above Tahoe city. Great location, well furnished and home owners are responsive and accomadattig. Thank you, James! I know your trip didn't start off perfect, arriving at night right after the biggest storm of the year, so i appreciate your patience in dealing with snow issues! However, I hope you enjoyed the bounty of snow the days after the storm passed! We would love to welcome you back anytime! We had a wonderful time! Thank you for sharing your beautiful home with us! It was the perfect place to ring in the New Year! Very nice, close to great skiing, hiking and sledding. One of the reasons we chose to buy this home was due to all the nice things you mentioned. We owned another home near Tahoma, which was also great for hiking, and other outdoor activities, but it was much more "rustic" and smaller, so we kept our eyes open for years for another home better suited to our needs. Other than this house is big & beautiful, it is also quite private, and is close to snowshoeing and hiking, and we belong to a wonderful private beach, one mile away, which we feel is the best on the lake! That really was the selling point for us. The beach membership is available to own to homeowners basically one mile wide around the beach, and then up the hill. So, it is rarely overcrowded. It has a mixture of sun, shade, sand and grass, with other fun things to do , like a playground, basketball, bocce ball, great picnic table (which can be reserved). Beautiful property. Close to everything. Thank you- we'd love to welcome you back anytime! We love that it is close to everything and was a big reason we purchased it! Tahoe City is only 5 minutes away! Access to private homeowners beach featuring private beach, BBQ and picnic areas, playground, basketball, horseshoes, shuffleboard, and volleyball. 2 blocks to Page Meadows for walks, hikes, dirt bike, snow shoe, and access to Tahoe Rim Trail. 2 miles to Tahoe City for shopping and dining. 1 mile to Private Homeowners Beach and Sunnyside Restaurant. Very quiet and private location located within Talmont community. Rates may vary from the standard $550 per night, depending on length of stay, holidays, etc. We request a 7 night stay during holiday and summer months. We offer a complimentary 8th night, as our calendar allows.